I know what you are thinking, "I had totally forgotten that Jessica was even pregnant!" I know, I had too…not! But, you know, not much is going on with pregnancy every single stinking week, so I thought I would just give an overview. Most of the time, I look at myself in the mirror and don't even think I look pregnant. Then I looked at my 18 week pictures and was like, no, I definitely am starting to look pregnant. In my first trimester, I blew my doctor away by gaining twice as much weight as I was supposed to. Yeah, I am so ahead of the curve. She wasn't as impressed by it as I was. She tried scaring me about it, but I really didn't care much. Really I didn't care because I had been so incredibly sick and so incredibly little even sounded good to me that I HAD to eat what I could…and it's not my fault that all I wanted to eat was crap! Anyway, I am back on the normal eating bandwagon, so hopefully I get that weight gain a little under control. Well, mostly normal eating. I still refuse to eat chicken. And I went to make us hamburgers the other day and was so disgusted by the raw meat that I couldn't bring myself to eat one. But mostly back to normal is a huge improvement from my carb only days for the first couple months. I started wearing a couple maternity shirts this week. I really needed to because of the length. I have found that a lot of my normal shirts just aren't cutting it lengthwise and it isn't fun to wear a tank top underneath them and have to pull it down constantly all day. But, it's hard because most of my maternity shirts are either ruched in the sides or are huge. 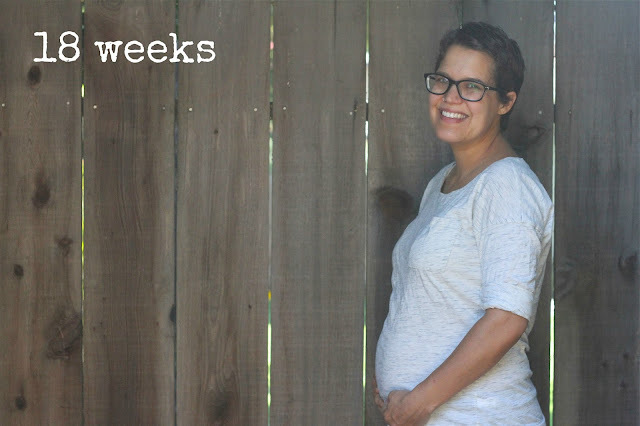 I wasn't quite ready to be obviously pregnant to the world because I don't feel like I am big enough (or I feel like I am too big for how far along I am…who knows, those feelings change so fast these days!) but it is about time. I think I have felt the baby move a bunch of times, but am still not fully convinced. It's just so hard when those little movements feel pretty much the same as having gas! But the other night, the baby was actually bulging out the side of my belly. Like I could press on it and feel it. And after pressing on the same spot for a minute, the bulge moved. So I definitely know something is in there. I look forward to feeling the baby move on the outside and knowing it is true movements I am feeling. I have my anatomy scan in two weeks. We won't be finding out what we are having. I kind of feel like it is a girl and kind of feel like it is a boy. I am leaning more toward thinking it is a girl than a boy. But, then again, I thought Isla was a boy my whole pregnancy, so don't trust what I think. And we haven't discussed names yet. Aww, names. One of the hardest things about having a baby to me. It's just easier if we wait though. I thought Connor was going to be Liam for most of my pregnancy, then one day Ian comes and tells me he no longer likes it because it sounded too much like Ian. So, it's better for me not to get too attached to a name and have to go back to the drawing board at the end. Plus, it gives us something to talk about while I am in labor! I actually feel like there hasn't been much change in my belly over the past several weeks. But this week (week 18) I am definitely feeling bigger. Plus, my belly is doing that weird thing where there is a huge flat spot where my belly button is, even though my belly button is not near an outtie yet and not near as big as the flat spot. But, something weird is going on. I remember it happening with Isla too. I told Ian the other day that I am starting to feel pregnant. Just that feeling of your belly stretching and noticing that there is a bulge coming from your body that isn't normally there. I'm excited for it though. I have waited for this feeling for a long time. You look so great!! :) absolutely loved to read the update always so exciting!! You look great! Glad you're feeling better and the lighting in you 16 week photo is spectacular!